Italian officials believe anarchists may have carried out parcel bomb attacks on two embassies in Rome as acts of revenge. Two members of staff were hurt, one seriously, in the blasts at the Swiss and Chilean missions on Thursday. A ministry official suggested the Swiss had been targeted because they had co-operated with Italy, arresting several anarchists earlier this year. He added that an anarchist had been killed in Chile in 2009. Several Italians allegedly linked to anarchist groups have been detained by Swiss authorities. In April, two Italians and a Swiss resident were picked up in Zurich on suspicion of planning an attack on the Swiss headquarters of IBM. Security has been tightened outside embassies and government buildings in Rome. Police have appealed to staff at the foreign missions to be alert for suspect packages. 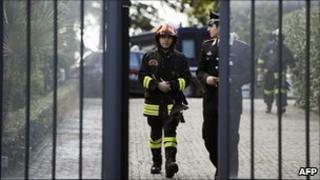 Investigators have revealed the contents of a blackened note found at the scene of the Chilean embassy blast. The message was signed by the "Lambros Fountas Cell" of the Informal Federation of Anarchy (FAI). Lambros Fountas was a Greek anarchist killed in a shoot-out with Athens police in March 2010. Immediate comparisons have been drawn with the string of parcel bombs sent last month to embassies in Athens and governments elsewhere. A Greek radical group, Conspiracy of Fire Nuclei, was blamed for those attacks. Small packages detonated at the Swiss and Russian missions in the Greek capital and a device was defused in a post-room at German Chancellor Angela Merkel's office in Berlin. Greek police spokesman Thanassis Kokkalakis has said there is no sign of Greek extremist involvement in the Rome devices, although he has suggested there may be a "measure of solidarity". In the Rome attacks, a Swiss employee was taken to hospital with serious wounds to his hands although the Chilean man was only slightly injured. Media reports say that the bombs were contained in two packages filled with explosive and metal fragments.